Teledyne Oil & Gas has added the CAN bus communication protocol to its Active Flying Lead product family. 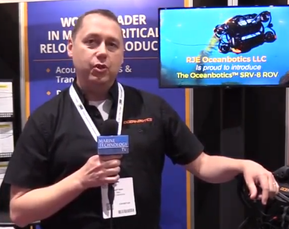 The subsea oil and gas industry has standardized to "fault tolerant" CAN bus communications for sensors and other subsea controls. This variation has a limited transmission distance for single node or sensor systems of only 40 meters. Teledyne has recently qualified three new configurations that extends the range of the CAN bus signal to up to 5,000 meters. The Active Flying Lead product line is characterized by integrating specialized electronics into qualified highly reliable atmospheric housings located directly within a subsea cable, or flying lead. The ability to run CAN Bus signals longer than before allows for greater flexibility in the placement of sensors in an oil field or subsea observatory. The alternative is to locate a control pod near the desired sensor placement, or by modifying the sensor location, even though an alternative location may have been more effective. The first variation electrically repeats the CAN signal. The CAN Repeater can double the original working distance with only one housing. For example, if 40 meters was original step-out length, then with the Repeater, the CAN jumper could provide transmission up to 80 meters. The second variation, which is also all electric, converts the "fault-tolerant" CAN bus into "high speed" CAN bus. 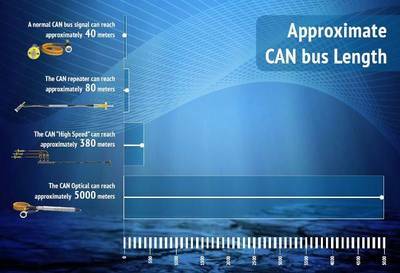 The "high speed" variation of CAN bus uses a lower voltage which experiences less line loss over distance. The reduction in loss allows the signal to travel over 300 meters before being converted back to a "fault-tolerant" protocol. This version requires two housings to convert the signal and convert it back. This allows for a total distance of up to 380 meters. The last option is an electrical to fiber optic conversion. One fiber is used to transmit and receive data. Two housings are used to convert the signal to and from fiber. The electrical section can each be up to 40 meters long. The CAN to Optical converter allows for distances up to five kilometers between CAN nodes or sensors.